Pro-Line Blockade MX Compound 8th Scale Buggy Tires « Big Squid RC – RC Car and Truck News, Reviews, Videos, and More! Our favorite tires for track use are Pro-Line Blockades. Blockades give fantastic traction and wear a long time, what’s not to like? 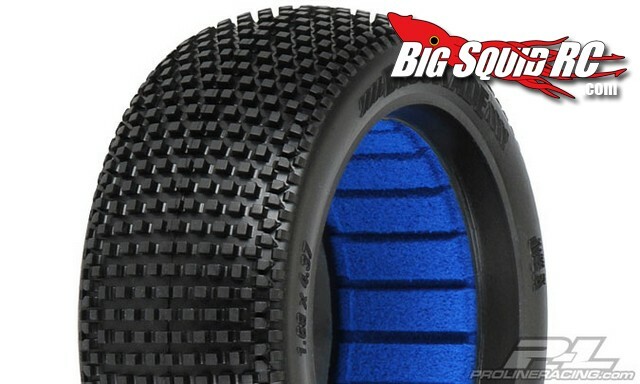 Recently, Pro-line has announced their extremely popular Blockade 8th scale buggy tires are now available in MX (blue groove) compound. Pro-Line’s MX compound is specifically designed for hot outdoor blue groove outdoor tracks where premature wear can become a big problem. The MX compound gives you a more stable tire with high wear resistance. Part number on the new Blockades is #9039-16, street pricing is $25 per pair, and you can hit up the official Pro-Line Website for more information. Have you checked out our Pro-Line Blockade SC short course tire review? Check it out HERE.